GURPS games can always benefit from an infusion of new ideas and tools. That's one of the joys of the GURPS library! But sometimes we have ideas that are too cutting-edge even for a standard Pyramid issue. 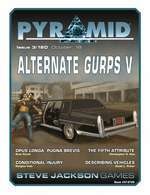 We have unleashed another such installment: Pyramid #3/120: Alternate GURPS V.
With this issue, you'll build GURPS vehicles quickly and easily based on real-world info, thanks to David L. Pulver. You'll also keep the flow between combat and non-combat elements, with new rules from Sean Punch. And with the other articles herein, you might even reconsider the way you look at magic, damage, and heroic advancement. With Pyramid #3/120: Alternate GURPS V, the impossible has just become easy and fun. Download this issue today, thanks to Warehouse 23!